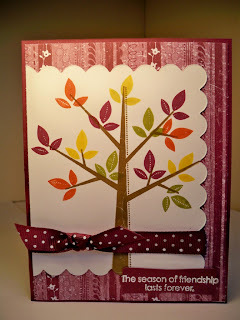 I made this card with some "new to me" Stampin' UP! goodies. After waaaay too long, I finally ordered the Season of Friendship set. It's soo versatile and I'm already thinking of a cute Christmas gift set I can make with this! I also used the Stampin' UP! Scallop Square Bigz clear die. This die would be perfect for cutting photos cuz you can see right thru it. 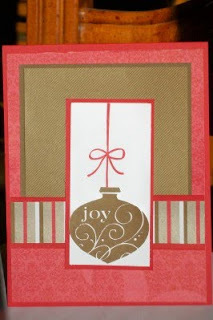 The sentiment was stamped in White craft ink then embossed with white embossing powder. I added some Rich Razzleberry ribbon and it was done. I made this card for the PPA#14 Challenge here. In honor of Breast Cancer Awareness we were to use anything "pink". 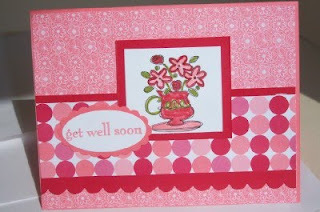 This card is in honor of my mother-in-law, Colleen who has battled and beat breast cancer. I thought of Melon Mambo and combined that with Chocolate Chip. I also used the new Medallion background stamp. I just stamped it on Whisper White in Melon Mambo then stamped on some scrap White in Chocolate Chip, repeated again with Melon Mambo then just layered the pieces. An Antique Brass brad from the Vintage brads finishes it off and some Melon Mambo 1/2 inch polka-dot grosgrain ribbon too! My thoughts and prayers go out to all those affected by breast cancer! Now that I've got my Halloween cards done, time to think about Thanksgiving. I made this card for the Splitcoast Card Sketch #252 here. 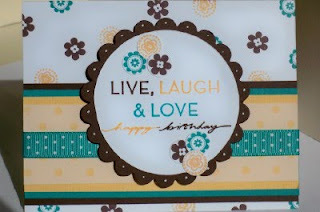 I used The Write Stuff Specialty papers and a die cut from that collection. Don't ya just love when the coordination is done for you?!? For the stamp sets I used Falling Leaves and The More the Merrier. A few punches, ribbon and viola! Here's my take on the Splitcoast Color Challenge #242 here. And I also used the MojoMonday Sketch #110 here. Whew! I'm really proud of myself when I can combine these sketches and challenges! I used three stamp sets for this one, Define Your Life, Loads of Love and Teeny Tiny Wishes. Everything is in the current catty except the strip of Kraft patterns paper, it's retired. 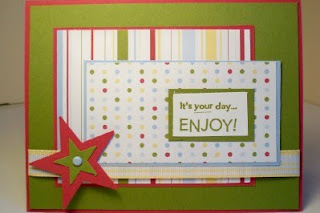 It's a rainy Monday here in Southeastern Wisconsin so I "made merry" and did this card for the Stamping 411 challenge here. This challenge was a little out of my comfort zone, only because it was to make a square card. It is pretty cute if I do say so myself. This is a bit too big to fit in an A2 envelope but it would make a nice gift card holder. 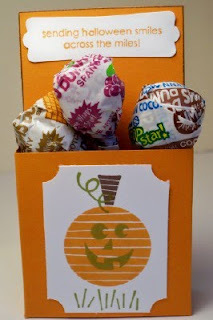 This cute little Pumpkin treat holder was made for the PPA #13 challenge, Anything But a Card here. I found the pattern on the Stampin' UP demonstrators web site. There are so many great resources there! This box fits three Dum-Dum suckers perfectly. This would be a great way to dress up those classroom Halloween treats. 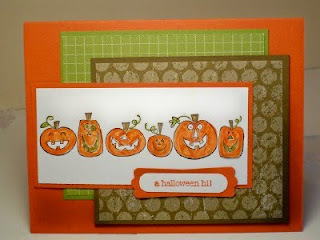 I used the Pumpkin Patch stamp set for the images. I made this Halloween card for the Splitcoast Sketch challenge #251 here. 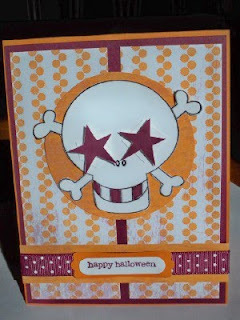 I need a few more Halloween cards and this one lent itself to using The More the Merrier stamp set. I also used the Old Olive Patterns papers and a Soft Suede piece from The Write Stuff Specialty Papers. It's my nephew, Patrick's 1st birthday next week and his party is Sunday. So I made this card for him using the MojoMonday sketch #109 here. I wrapped his present in wrapping paper that has these three colors. 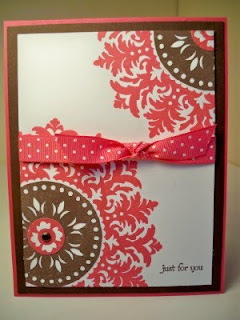 I think it's a great color combo for boys, especially the cute little one I'm giving this card to on Sunday! I can't wait to see Patrick eat his cake with his hands! Everything on this card is current in the catty except for the #1. That's from the retired Big Deal Numbers set. I'm really rolling on my Christmas cards. I got an order from a customer for Christmas cards so I made this one after seeing an awesome idea on Jill Hilliard's blog. 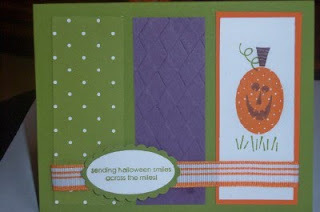 Here's the link to her blog and the idea to use the Pumpkin Patch stamp set for images other than pumpkins. She's got really cute ideas so thanks for the inspiration! I changed the card a bit and used the Top Note Die. I also used the Christmas Cocoa Specialty Papers. 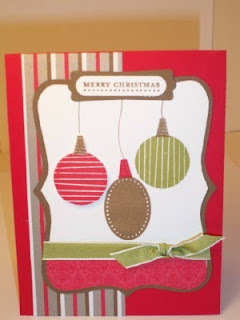 This Christmas card is for the Stamping 411 Challenge here. Their challenges are fun and quick because they give you helpful measurements for your cards. I used the Two Cool Dudes stamp set and the snowflake from Delightful Decorations for the background on the Whisper White piece of card stock. The striped paper is from the Christmas Cocoa Specialty paper. 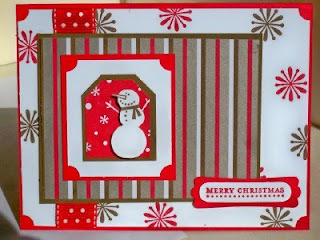 I propped up the snowman with some Stampin dimensionals but it's kind of hard to see in the picture. Really cute in real life! This Halloween card is for the PPA#12 Challenge here. This week is a sketch challenge and I thought of Halloween and the skull image from the Just Jawing stamp set. I used the Pumpkin Pie and Rich Razzleberry papers from the Razzleberry Lemonade DSP. A little Razzleberry ribbon, Happy Halloween from Teeny Tiny Wishes, the Word Window and Modern Label punch and it's done. This card is going to my 4 year old nephew, Brady, who is really into skulls! It's my baby's birthday (but he's no baby anymore!). Max is 11 today so here's his birthday card. I made it according to the Mojo#108 sketch here. It's hard to believe he's 11 already. He was only 1 year old when we moved back to Wisconsin 10 years ago. My how time flies. Now he's almost as tall as me, a kind kid who loves football, basketball, baseball and anything he can play! He's a great kid and we're lucky to have him. Splitcoast Sketch #250 here. 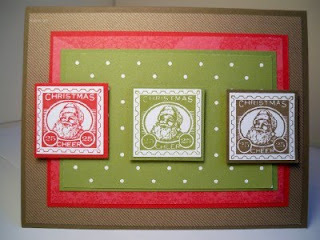 When I saw the squares I instantly thought of the postage stamp image from the Christmas Punch stamp set. I inked that up in Real Red, Old Olive and Soft Suede, punched it out with the 1 1/4 inch square punch and layered it with the 1 3/8 inch square punch in coordinating card stock. The Old Olive polka dot papers are from the Olive Patterns DSP and the Red and Suede papers are from the Christmas Cocoa Specialty Papers. Playing along with another Splitcoast Color Combination here. The colors are Bermuda Bay, Apricot Appeal and Chocolate Chip. I wouldn't have thought of these together but that's why this is a challenge. 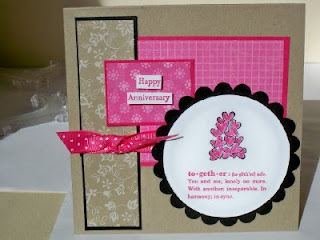 I used the Little Flowers and On Your Birthday stamp sets. The strip of patterned Apricot paper is from a long retired Prints Pack DSP from the 2008 Spring Summer Collection (ok, I know I have a paper hoarding problem!). Otherwise everything else is current. I'm just playing catch up after a busy weekend. This card is for the Stamping 411 sketch #120 here. I thought of buttons for the small elements in the corner so my colors for the card were chosen after I picked my buttons from the Fresh Favorites II. And the colors are Always Artichoke, Rose Red and So Saffron. 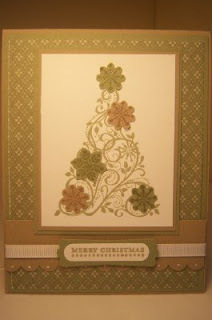 The stamp set is Trendy Trees and the paper is from the To the Nines Specialty papers. Some hemp twine finishes off the buttons. I quickly whipped up this card for the PPA#11 Color Challenge here. The colors are Perfect Plum, Old Olive and Pumpkin Pie. So of course I had to use the Pumpkin Patch stamp set. I ran the Perfect Plum paper thru the Big Shot with the diamond pattern from the Backgrounds 1 texturz plates. Then just stamped the sentiment in Old Olive, punched that out with the Large Oval punch and layered that on the Scallop Oval punch. A strip of 1/2 inch Pumpkin Pie striped grosgrain ribbon and it's done. I used the layout from this card. See what different stamps and papers can do! I made this card for the Splitcoast Card Sketch #249 here. I used two stamp sets for this one. The hanging bow is from Berry Christmas and the joy ornament is from Delightful Decorations. I punched out the ornament stamp with the Ornament punch from the Holiday Mini. So quick, simple and cute! 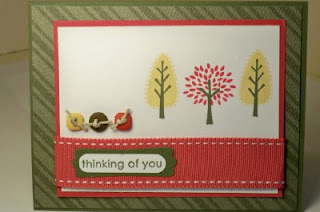 I made this card for the Splitcoast Color Combo #231 here. The colors are White, Kraft and Mellow Moss. I only have 2 sheets of Mellow Moss-obviously not one of my favorites. And I used the patterned Mellow Moss from the Level 1 Hostess Patterns Pack DSP III. The tree is from Snow Swirled. Looks a lot different than my card from yesterday doesn't it? 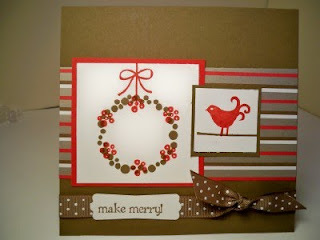 I embossed the snowflakes with Versamark and Clear Stampin' Emboss Powder on Kraft and Mellow Moss. 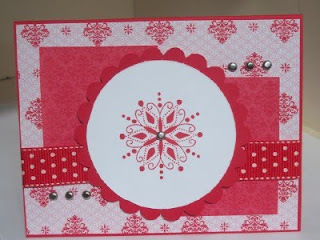 I used the three snowflake stamp from the Christmas Punch Hostess set and the coordinating Boho Blossoms punch. A strip of Kraft was run through the Scallop Edge punch. The Merry Christmas greeting is from Teeny Tiny Wishes and I punched that out with the Word Window Punch and layered it onto a Mellow Moss piece punched with the Modern Label Punch. It's another card for the Mojo Monday sketch here. I've got Christmas on my mind again and my favorite color, red ,too. So I thought I'd use the papers from the Christmas Cocoa Specialty papers. I stamped the large snowflake from the Snow Swirled set. Then I used my Coluzzle to cut out the circle. The Real Red scallop circle is cut with the Scallop Circle #2 Bigz die. A strip of Real Red 3/4 inch polka dot grosgrain ribbon and some silver brads finish it off. Since it's World Card Making Day I had to make a card. Big surprise, I always love to make cards! 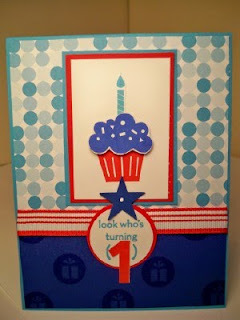 I made this one for the Stamping 411 challenge. And it's for my mother-in-law who is having surgery this week. I think the bright colors will cheer her up. I used my blender pens to color in the vase and flowers. And the papers are from the Pink Flamingo Designer Series Papers. Quick and cute. I hope to make lots more cards on this day later. I made this one for the Pals Paper Arts #10 Theme Challenge of Gratitude and Thanks. 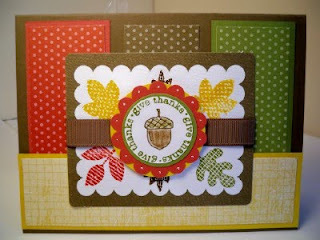 I used the Falling Leaves set again because one of the leaves says "give thanks". And just because I love this set. I stamped the different leaves in Rich Razzleberry, Dusty Durango, Crushed Curry and Soft Suede. Then I punched them out with the 1 1/4 inch square punch and layered each square on the coordinating color card stock that I punched out with the 1 3/8 inch square punch. 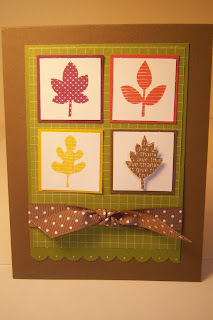 I popped up the Soft Suede leaf that says "give thanks" with Stampin' dimensionals. I used a rectangle of Old Olive Patterns paper and layered that on a piece of Old Olive card stock, one end of which is scalloped with the Scallop Edge punch. A little Soft Suede polka dot grosgrain ribbon, a bit of white gel pen dots and that's it.